Today was RACE DAY! I ran the Operation-Giveback 5K held at the University of Central Florida. 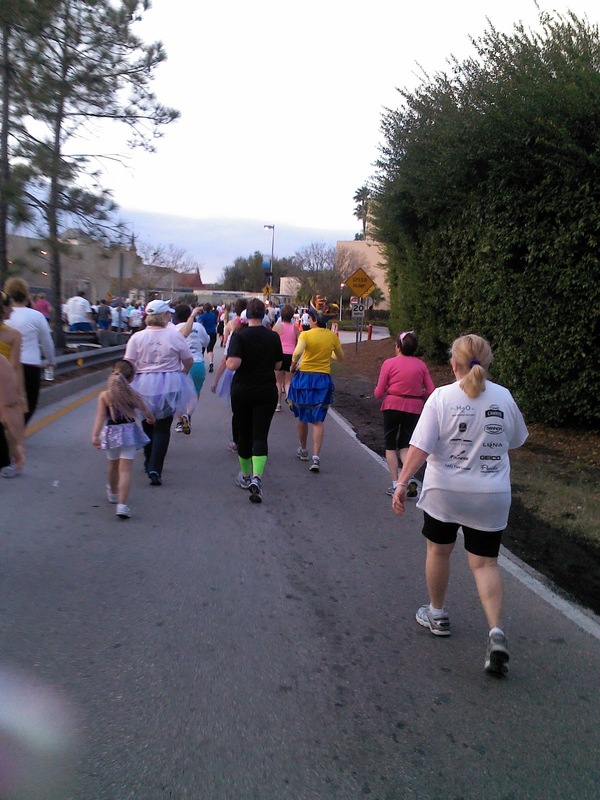 This is the 2nd annual run, so there wasn’t a huge crowd…and that was just fine with me. Almost all of the course was run on sidewalk and I wasn’t too happy about that. Well, let me say it this way: my hip joint wasn’t too happy about that. However, it didn’t hurt to the point where I started limping and am not in pain some 8 hours later. Thank goodness for good running shoes (I wear Adidas) and good socks too (those are Adidas as well). My manicure is using Pure Ice’s Vinyl Remix collection. I used the green (‘DJ Spinner’), yellow (‘Emcee Me’) and purple (‘Vintage Remix’). What is fun about using these polishes is that I don’t have to be steady-handed. I apply the ‘Platinum’ Magic Base Coat, first. Then the black shatter polish over that. Instantly, the black shatters and the white polish is ‘stained’ to show a particular color. Neat!!! I did each finger in a different configuration and made it fun. I added a top coat to enhance the shine and extend the wearability. And, at the end of the race at the photo op. Pure Ice Vinyl Remix collection was provided to me for my honest review. My opinions are totally my own. P.S. Why did that shirt-less dude, to the left, photo-bomb my winner’s circle photo!!? Race Day! And I won! OK, I didn’t win THE race but I won my own admiration. 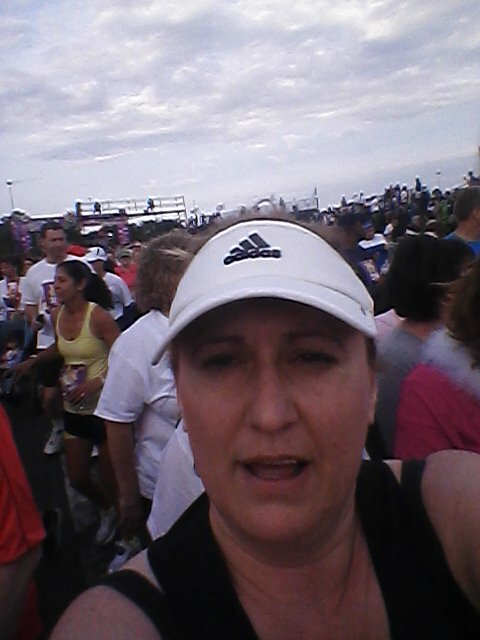 I set a new, personal best time and I completed the 5K race. Hooray! Oh, and I got a medal too! Here I am all ready to begin. Yes, it was dark; I got up at 3:30 AM and was at DisneyWorld by 4:15. The race started promptly at 7 AM. I had to get there early because the parking lot was going to fill up fast. 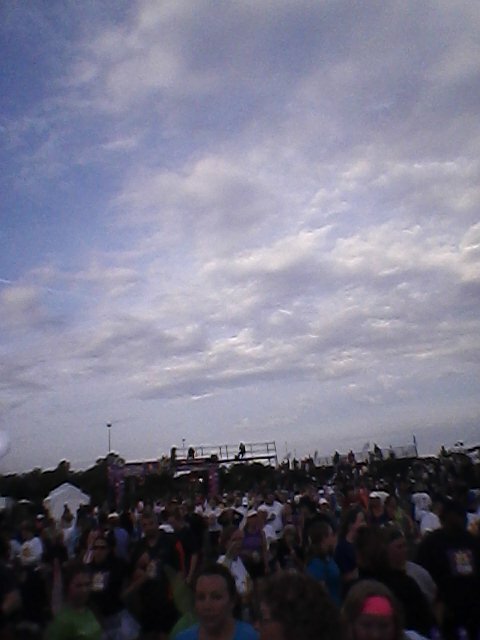 There were 5000 runners alone. It was windy and chilly. But that made it perfect weather for me to run. 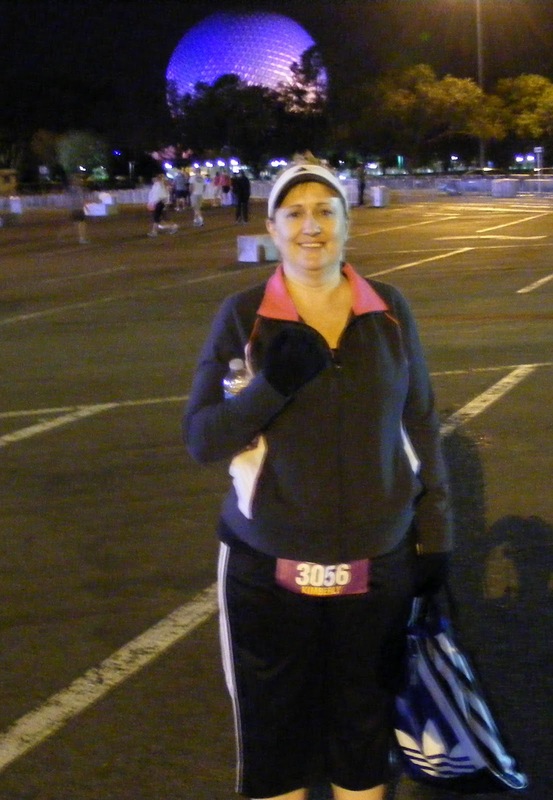 Before the race I shucked the gloves and about 1 mile into the run, I tied my jacket around me too. If you look in the middle of this photo, you can spot me in my white visor, coming into the finish line. Yes, running! This is 3 coats. I don’t have on a top coat because I wasn’t going to leave it on this weekend. I knew I was going to do more swatching.However, this was a fun manicure and I got a couple of compliments on it. There is approximately 2/3 magenta glitter to 1/3 silver. The silver helps give it a twinkle. You can imagine how cool ‘Hot Pink’ would be layered over a variety of base colors. 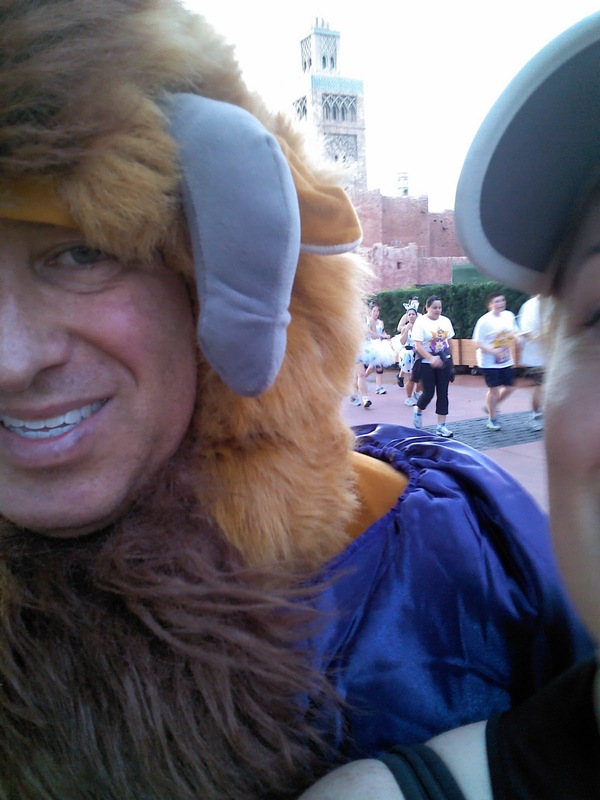 I tried to snap a photo of me running with the Beast from Beauty and the Beast. What a cute Beast at that! I came upon a woman dressed like the Chiceta banana lady. Once I got past her, it wasn’t a good idea for me to turn around and snap a photo, though. I’m coming up to run around the ball and then into the home stretch. A photo of the crowd of runners once I crossed the finish line. 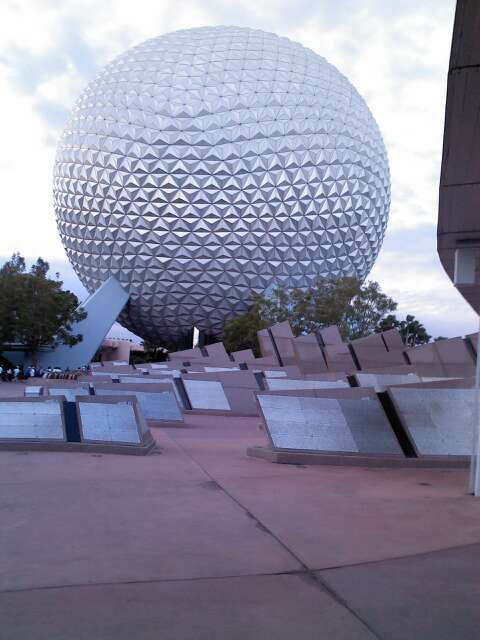 After more fretting than necessary, the run was fun and I enjoyed running around Epcot. 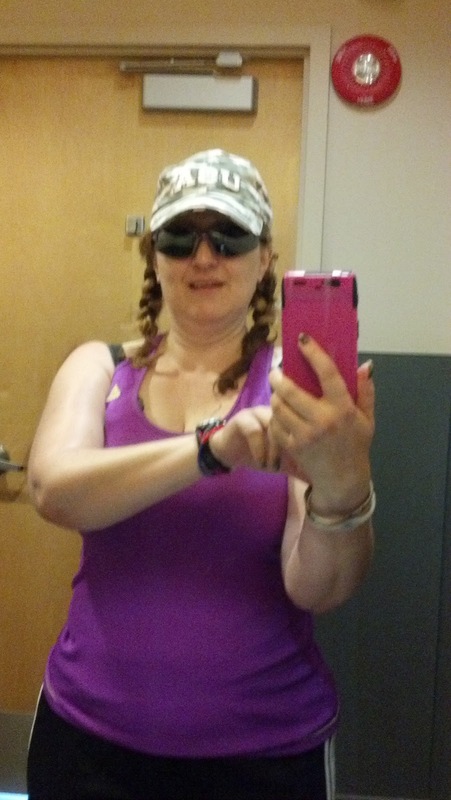 The weather was great and I got some cool swag food after I had my offical race photo taken. I milled around a bit after that then went back into town and celebrated with a Starbucks chai tea. What grand moment did you have this weekend? Do you find ‘Hot Pink’ a fun polish for the my race?